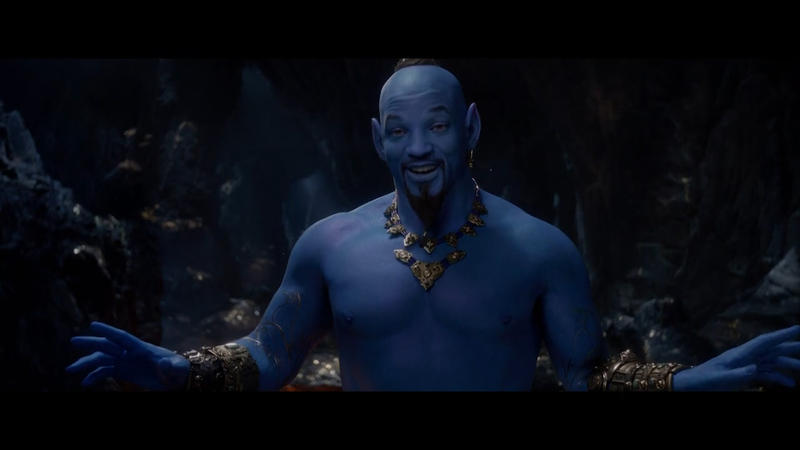 Tonight during the 61st annual Grammy Awards, we got our first TV spot for the film which gave us our first look at Smith as the blue skinned Genie, take a look above? While the first 55 seconds of the one-minute clip was promising enough as we got our first good look at director Guy Ritchie's whole new world of Agrabah, including Naomi Scott's Jasmine, Marwan Kenzari's Jafar, Apu the Monkey and even Magic Carpet. A new trailer for Aladdin was released on Sunday, and it contains a fair amount of new footage. Smith responded on Instagram that he would indeed be blue in the final film, "I'm gonna be BLUE!" According to the actor, the full movie would see him in the cerulean guise fans first fell in love with when the late great Robin Williams first realized the role of the motor-mouthed wish-granter back in 1992. Then in December, Entertainment Weekly published photos of Smith in the Genie costume, though he wasn't blue at that point. For whatever it's worth, I don't think this looks awful, I'm just sort of amazed at how clumsily they've handled all these reveals. Buchanan went on to admit that his terror slowly turned to twisted fascination: "The Will Smith genie makes me feel the same way I feel when a celebrity dies: Nauseous, sad, and like I can't wait to tell everybody about it". Aladdin opens in theaters on May 24.